Students 6th – 12th grade, come join us Sundays at 4:30 pm to hang out and study God’s Word together. We aim to help students grow in their faith and personal relationships with God through a weekly small group environment. In our Student Ministry (6th-12th grade), we seek to develop a strong, gospel-centered foundation in our students through studying the word of God and living out biblical community in small groups. Student ministry is where our students begin to experience what small group life is like within the church. We want our students to form deeper relationships with each other, their leaders and most importantly, Jesus. 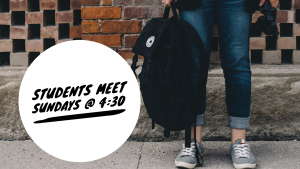 On a weekly basis our students gather from 4:30-6pm at a local home and meet in small groups that are broken up by age or gender to study God’s word. It’s a great mix of adult led bible study, social activity, accountability, fun, and even some food to keep their energy levels up. These small groups are user friendly, and a great place to invite friends! For more information, contact us at students@cornerstonecommunity.com.